Thanks for the newsletter and the little extra nag to keep doing The Elephant Salutation! little nudge to keep practising it. I would like to take this opportunity to say how much I enjoy your classes. Your experience and passion for practicing and teaching yoga shines through; and the serene location of Preston Village Hall is perfect. 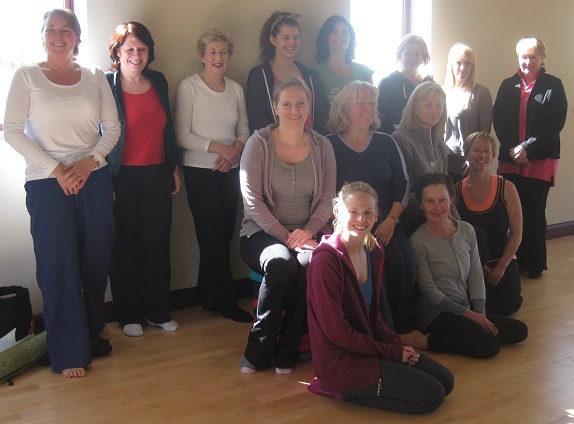 I am relatively new to Rutland and joining your yoga class has helped me feel at home. The 1-2-1 yoga therapy session I had with you a couple of weeks ago has given my home practice a tremendous motivational boost as I’m now working to a personal programme designed to meet my individual needs and feel more committed as a result. Thanks also for your continued interest in my progress when we meet at group sessions. I love your class! I had the best night’s sleep in ages after last weeks! Thank you so much. I just want you to know that although I haven’t made it recently to yoga I can’t tell you how much I appreciate what an amazingly GOOD teacher you were. took us through at the end of the class was linked to this. I am still rushing up and down to take my mother on H visits but I sometimes have to get out of the car and just stare at the wonder of some of the views on the Pennines that I just didn’t realise were there when I was growing up. So it is never a chore really and my mother is not a burden although is now in a home and remembers very little. I notice that the Tuesday morning class has finished, but you are busy with many other ones. Please keep sending your newsletter if you don’t mind…and sending you my best thoughts. > I’m really enjoying your classes and being able to practice yoga again. You explain everything very well and I’m learning and remembering a lot more than the previous classes that I went to, this in turn helps me to do more practice at home. Keep up imparting the yogic philosophy, I could visualize some of the images in the last relax session, an area I have been working on in the summer. Rock n roll Debs. Taking up yoga, having suffered greatly from stress in my mid fifties was a big step. However I have thoroughly enjoyed gently easing my body back into fitness and a new feeling of wholeness through my breathing and movement.Debbie very carefully takes students through asanas (movements) and if someone is new to yoga she explains how the body is working through diagrams and explanation. The meditation is wonderful and encourages relaxation, clarity of mind and peaceful sleeping patterns.The classes are friendly and everyone is helped as an individual. I would just like to thank Debbie and everyone I have worked alongside with for an inspiring start to yoga. I just wouldn’t want to be without my yoga practice now. Yoga can be life changing .Thankyou.Hazel. I’d like to thank you making me feel welcome at your Tuesday evening yoga sessions at Preston. I really appreciate the importance you give to establishing a good working environment, gently insisting on minimum clutter in the workspace, early arrival and suchlike. The calm atmosphere this creates helps me clear my mind and focus on the yoga. At the end of the session, I always feel refreshed and relaxed, despite having worked hard. I invariably sleep well that night. Hi Debs just wanted to thank you for all the work & wisdom over the last six week’s in the class, it was good and went very fast. Just wanted to say thank you very much for all. Yoga has really helped me so much, I cannot tell you. Thanks very much to all who took part in the Spring Term “Satisfaction Survey”. I was impressed with a 93% overall satisfaction rating! The poorest section was the HOME PRACTICE with 29% of students admitting to not rolling the mat out in between sessions. Next year I’ll aim to post an ‘Asana of the Week’ on the blog. Why not sign up as a follower of the website and then you will get an email reminder each time I post??? The second poorest score came from feeling an ache or pain following the session… 12% felt this. If this is you – please always listen to your body in class – be fully conscious of what is happening inside. Always work within your comfort zone and back away from anything painful. It would help if you practiced a little in between sessions too(!). The third poorest result was the environment, where 10% felt the heating was insufficient. I have contacted the halls and asked for additional heating to be supplied. The difficulty is that when we meditate or do breath work the body temperature cools down quite a bit, therefore, if this is you – try bringing along an extra layer of clothing and an extra blanket. It is important to be warm so that the body and mind can truly relax. Just to say how much I enjoyed the fun packed class on Wednesday. Thank you for that and for your work in making the whole term so rewarding. Student Survey Dec 2013: How have the yoga classes affected you in your day to day life? THANK YOU VERY MUCH FOR YOUR FEEDBACK – IT IS REALLY IMPORTANT TO ME! I just realised how close we are to Christmas so I thought I would contact you to try and book myself on one of your classes for next term. I cannot wait to get all booked in for next term as I am really enjoying my weekly yoga with you! Many thanks Deb, have a good weekend. Yoga helped me to be ‘man of the match’! Thanks to everyone – I really enjoyed teaching the workshops and look forward to working on some more ‘themed’ classes. Thank you to all for your feedback and encouragement – it means a lot to me. I can’t tell you how happy I am to have joined your yoga classes. I have thoroughly enjoyed them and look forward to it every week. I am reading books recommended by you and they have really opened my eyes to many things. It has made me look at life differently and encouraged me to seek more knowledge of yoga. Knowing little about yoga, I joined your classes not really knowing what to expect. I was slightly apprehensive because recently I left a very stressful job and had a couple of surgeries, and while recovering I became very unfit. I put down constant aching in my joints and neck to my age and poor health and tried to live with it, ignoring waking up in pain every morning. When in the first class you explained correct posture alignment and simple relaxation exercises, it felt great. At night I usually toss and turn and have trouble finding a comfortable position to sleep in. Lying in savasana and doing breathing relaxation was like a revelation, and when I woke up in the morning I felt refreshed and painless! I do the same every night since, and am quite astonished how the simplest of techniques can have such a fantastic effect on the body. Thank you so much for saving me from neck pain and thank you for running the Introduction to Yoga at the Stamford College. I enjoyed each class very much and I hope to find a suitable beginners class in my locality to continue. I meant to say to you that I think that the gradual way that you have built up the classes has been fantastic. Over the years, I’ve done quite a few yoga classes and sometimes they just race ahead too much and you can end up feeling stiff for days. Your tuition has been really clear and precise and that’s so important. You’re doing a great job! I’m so pleased that after only 2 terms the ground seem to be getting nearer and nearer in the forward folds. (I actually touched it the other day!) Wonderful!